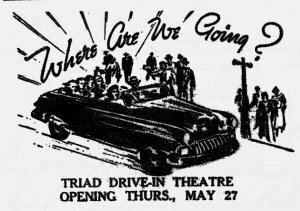 The Triad Drive-in was to originally open on Thursday, May 27th, 1954, but was postponed until the next night because of bad weather. The opening of the Triad was a pretty big happening for the small city of Ashland. 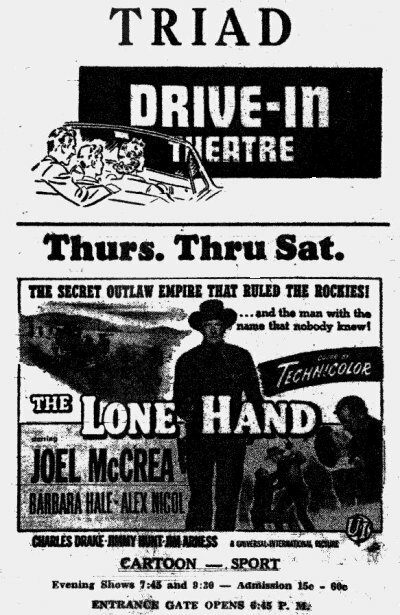 There were numerous articles and many advertisements taken out by local businesses congratulating the opening of the Triad. As of 8/11/2000 the projection building and what I believe was the marquis are still standing. One of the overhead lights that were used to light the parking area are still standing as well. The screen is gone and there is a vacant business on the property. The land is currently for sale.